The U. S. Signal Service was organized to open and maintain communications, to note the development and progress of storms, to predict probable future atmospheric conditions and to report on the conditions of the sea and navigable rivers. 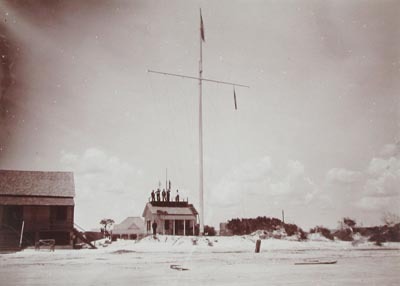 Signal Service Stations were established in connection with lighthouses and life-saving stations, connected by telegraph and offered communications to ships at sea by light or flag (and later by radio). They also summoned assistance to vessels in distress from the nearest life-saving stations or ports. 29368. (lot 4 photos) United States Signal Service Station. Circa early 1900’s. The Signal Service was organized to open and maintain communications, to note the development and progress of storms, to predict probable future atmospheric conditions and to report on the conditions of the sea and navigable rivers. In the later 1870’s, some forty odd observation stations were established in the principal cities of the country. The organization was sufficiently complete so that on the 1st of January, 1871, regular reports of weather observations taken synchronously were telegraphically reported to the Washington office. 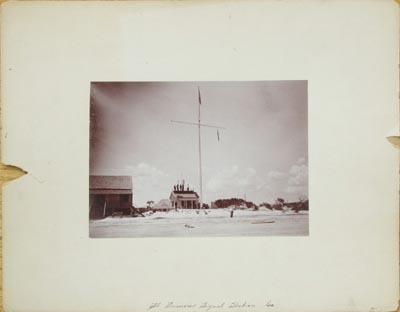 Signal Service Stations were established in connection with lighthouses and life-saving stations, connected by telegraph and offered communications to ships at sea by light or flag (and later by radio). They also summoned assistance to vessels in distress from the nearest life-saving stations or ports. After the turn of the century this organization would become the U.S. Weather Bureau. 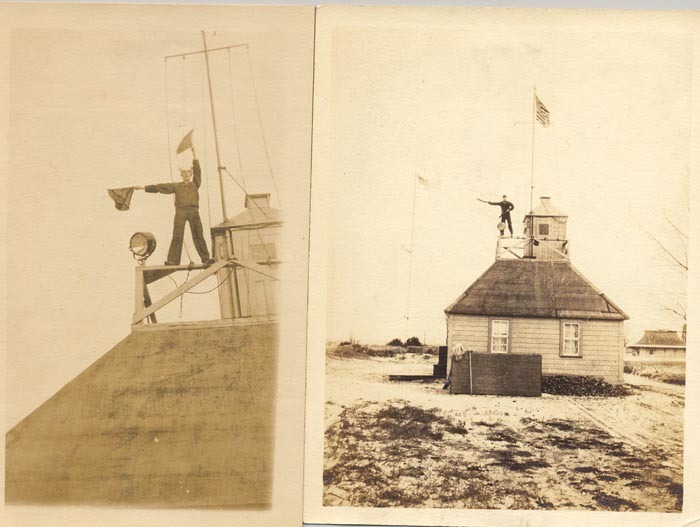 Great lot of four photos show rarely seen details of a signal station, roof signal tower with man signaling by semaphore, and even a rare interior view of the station. 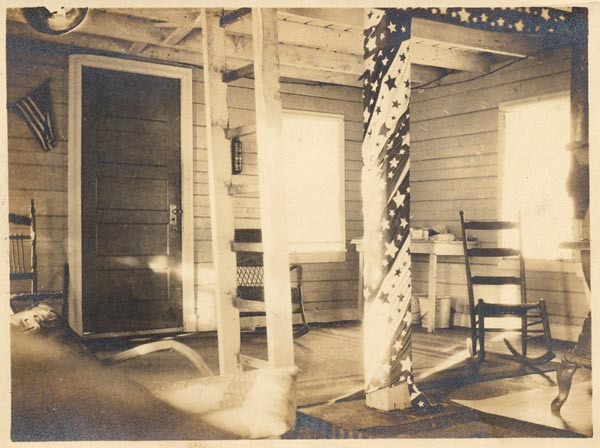 Photos measure 3 ¼” x 4 ½” and are b/w. (VG). Lot 4 photos $84. 29368c. 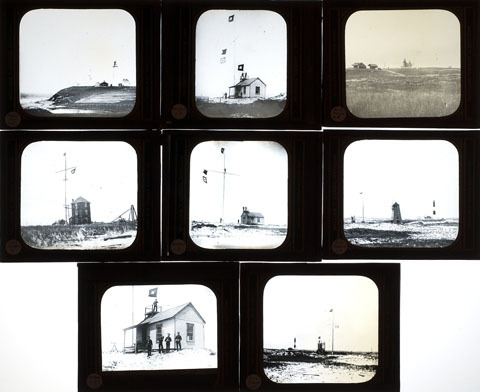 (lot 8 glass projection slides) United States Signal Service Stations c.1878 - 1898. 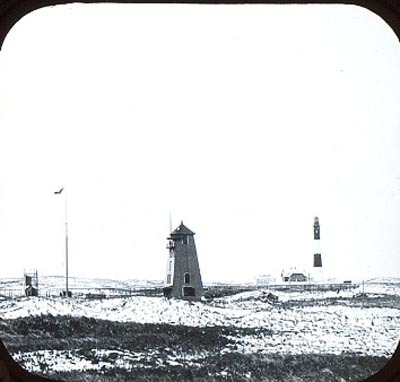 Excellent lot of 8 b/w glass projection slides provide rare views at Coast Signal Stations on the Atlantic Coast. Stations include Montauk Point, Quogue, NY., Block Island at Southeast Light, Fire Island, Cape Henlopen. The Signal Service was organized to open and maintain communications, to note the development and progress of storms, to predict probable future atmospheric conditions and to report on the conditions of the sea and navigable rivers. In the later 1870’s, some forty odd observation stations were established in the principal cities of the country. The organization was sufficiently complete so that on the 1st of January, 1871, regular reports of weather observations taken synchronously were telegraphically reported to the Washington office. 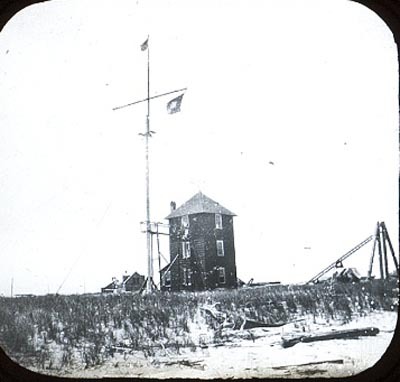 Signal Service Stations were established in connection with lighthouses and life-saving stations, connected by telegraph and offered communications to ships at sea by light or flag (and later by radio). They also summoned assistance to vessels in distress from the nearest life-saving stations or ports. After the turn of the century this organization would become the U.S. Weather Bureau. 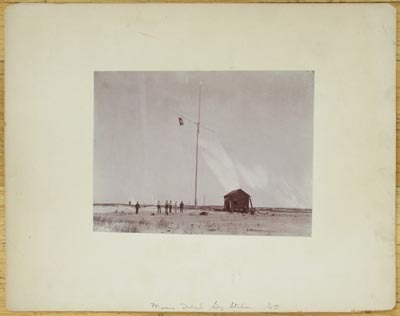 These views are exceptionally rare and provide unprecedented details of these remote outposts including the buildings, roof signal tower with men signaling, and more. The glass slides measures large 3 ¼” x 4” and would provide a large clear view. Fine, clear images, close, quite detailed, rare. In original box. (VG+). Lot 8 slides $595. 7278c. THE NEW YORK SIGNAL SERVICE STATION. Scientific American. November 2, 1889. 2p. 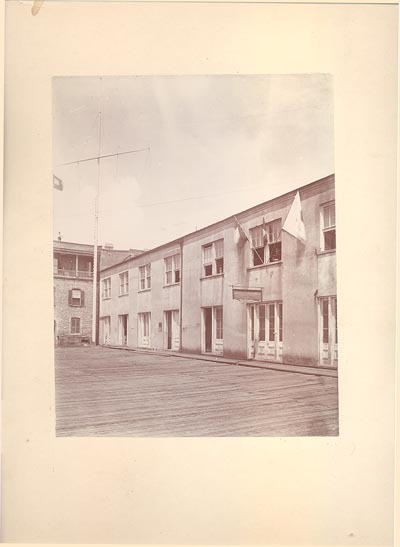 The U. S. Signal Service was organized to open and maintain communications with ships at sea, to note the development and progress of storms, to predict probable future atmospheric conditions and to report on the conditions of the sea and navigable rivers. 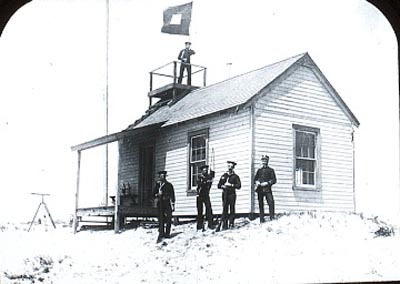 Signal Service Stations were established in connection with lighthouses and life-saving stations, connected by telegraph and offered communications to ships at sea by light or flag (and later by radio). They also summoned assistance to vessels in distress from the nearest life-saving stations or ports. Also, they were charged with recording and coordinating meteorological and ocean observations. This is a very clear, detailed full front page with four engravings depicting the station and equipment of the United States Signal Service. Includes complete article describing their apparatus and their work. Unusual detail, some wear and chipping to edges. (VG). $42. 5200. The following official pamphlets or publications of the U. S. Life-Saving Service are available in photocopies either individually or as a complete set. [complete set of 13 publications] Spiral-bound photocopy $45. 23226. Maury, Professor T. B., THE TELEGRAPH AND THE STORM. THE UNITED STATES SIGNAL SERVICE. Harper’s New Monthly Magazine. c.1870. 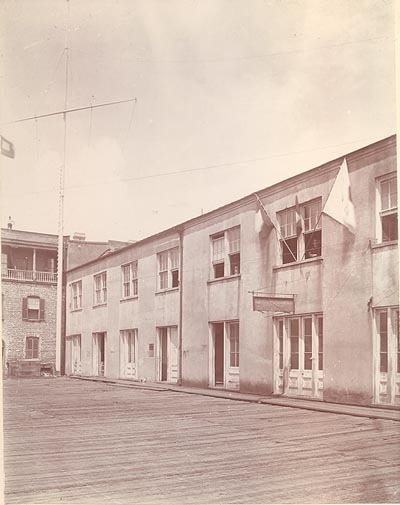 21 p. The U. S. Signal Service was organized to open and maintain communications, to note the development and progress of storms, to predict probable future atmospheric conditions and to report on the conditions of the sea and navigable rivers. 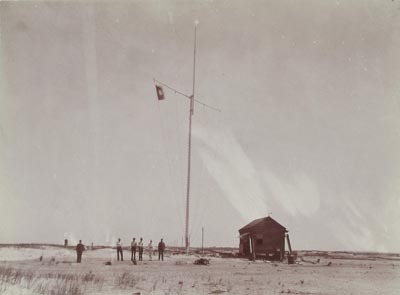 Signal Service Stations were established in connection with lighthouses and life-saving stations, connected by telegraph and offered communications to ships at sea by light or flag (and later by radio). They also summoned assistance to vessels in distress from the nearest life-saving stations or ports. Excellent account of the work of this little-known agency. (Photocopy $5). 3168. U.S. Signal Service Agency. OFFICIAL DANGER, DISTRESS AND STORM SIGNAL CODES FOR SIGNAL SERVICE SEA-COAST STATIONS AND MARINERS. Wash. GPO. 1883. 91pp. Lists all pennant and light signals recognized by all sea-coast signal stations, and by the Life-Saving Service. Also lists all United States Life-Saving stations and Signal-Service stations. With plates and diagrams. (Photocopy $18). 4170. HISTORY OF THE SIGNAL SERVICE with Catalogue of Publications, Instruments and Stations. Washington City . 1884. 39pp. Includes a complete history of the U.S. Signal Service as well as a listing of stations. Soft wraps. Illustrated. (Photocopy $7.80). Page updated August 05, 2016 . All text and illustrations on web site Ó James W. Claflin . 08/05/2016 All rights reserved. Use prohibited without written permission.